Hello Friends. I apologize for my absence during these summer months. I have let things go to take some time to enjoy the sunshine, company, family, and camp. All the things in Northern Ontario that we wait for. I may not have been blogging but I have been busy getting my samples and pattern ready for my workshop in November. 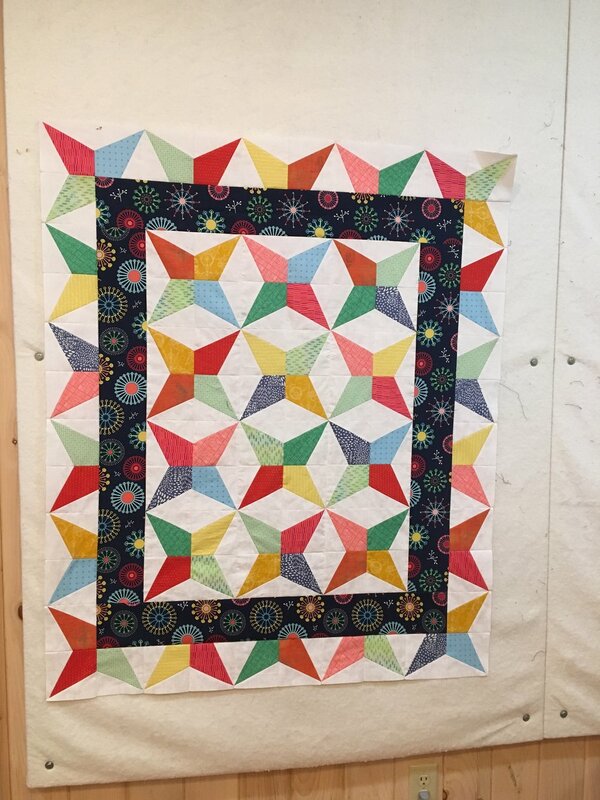 I am so excited for this years’ workshop, as I will be teaching my latest new design, “Catch a Falling Star.” A big “Thank you” to Donna DenOuden, (one of Leianne Monro McCallum’s students from Quilters Cupboard in Uxbridge Ontario) who first came up with the combination star. For more information about the workshop and to find out how to register, click here. I recently spent some time in Rangeley Maine with some long-time fellow professional quilters. We stayed at the “Rangeley Retreat Centre” owned and operated by Dan and Carol Perkins. They also have a quilt shop next door, which I frequented a few times during my stay. I was glad that I stayed for the week as I had to account for the large bag of fabric to the nice man at the border crossing. May I say that, the shop, retreat house and the little town makes you feel like moving and just quilting all the time. Here is a few pictures of the quilts and the gang from my trip to Maine. Click on the image to view the next picture. The week was filled with quilting, sharing of ideas and knowledge, and testing new techniques, patterns and tools. I came home with a new teaching technique, one that I am excited to implement into my classes this fall. You will just have to sign up for a class to see what it is. During my visit, I started and new quilt! What else in new. :) I was surfing on Pinterest and found a picture of a quilt that just jumped at me. So off to the quilt shop next door ( be glad that is not something that is available here at home) for guesstimated amounts of fabric. I have found out that this quilt is called “Shakespeare in the Park” by Judy Martin. With some cutting and stitching here is the start to my new quilt. I am going to throw in some changes from the original picture, just to make it my own. May I say, that making a quilt from a picture is so easy when you use Studio 180 tools. The tools allow you to make a wide variety of sizes, the have easy to follow directions and then square up the units for precision. Voila! It is now mid-August, I am back from holidays and spending my days getting caught up and organized. I hope that your summer has been filled with special times and I look forward to connecting with everyone as fall approaches. I have had quite a few bookings so check out my calendar frequently as I will be updating it as thing arise. Anne Hubert's Block of the Month done here at the studio. To finish, here are a few pictures from our quilty friends that I have received over the summer. Glad to see that you have put those rainy days to good use. Thanks for dropping by. Until next time, stay safe, enjoy the rest of summer and eat lots of local produce. Older PostMay! Wait May, Come Back!